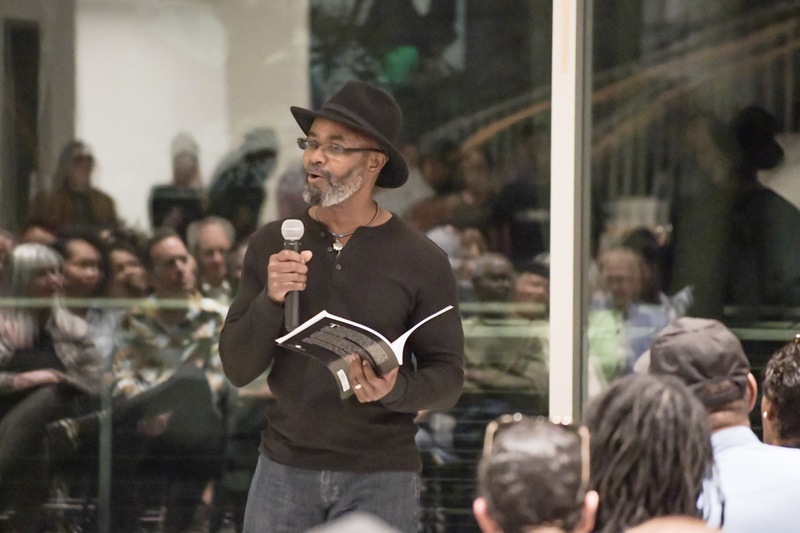 Eddie Melton took part in the national discourse last week during a spoken-word event in front of a packed room at the Birmingham Museum of Art. Melton was one of more than a dozen artists from the Birmingham metro area who performed their spoken-word pieces during Bards and Brews, a poetry performance and beer tasting hosted by the Birmingham Public Library (BPL), usually on the first Friday of each month. The event came ahead of National Library Week, April 7-13, an annual celebration highlighting the valuable role libraries, librarians, and library workers play in transforming lives and strengthening communities. While some of the presenters last week were previous performers at Bards and Brews—one of the more popular BPL-sponsored activities—several were first-timers. Poets had the opportunity to recite one or two short poems or one long poem about any topic; each poet had about three to five minutes for the set. Bards and Brews has been around for about eight years and has served as a platform for poets to gain confidence to appear at venues across the nation. The event has been held various locations, including local bars, community organizations, the McWane Science Center, and the BPL Central Branch. Some of the poems presented at last week’s event were about race, age, gender, love, and relationships; others focused on growing up in Alabama and even current national events. Melton’s “Mr. President” touched on the children separated from their parents at the U.S.-Mexico border. “You separated us without a clear-cut means of putting us back together again. That was cruel and cold. One day, Mr. President, the story will be told. How you treated us and all of that stuff, you treated us worse than you treated the president of Russia,” Melton spoke to an appreciative crowd. K-Light’s piece, “Those Who Were Once Unknown,” memorialized those at the National Memorial for Peace and Justice in Montgomery, Ala., which commemorates the victims of lynching in the United States. K-Light said she enjoyed the diverse audience and the intergenerational and interracial group of poets that performed at the event. The diversity of the performers speaks to the fact that “artistic expression—whether its art, poetry, or music—brings people together for a common goal and also shows that we are more alike than we are unalike,” she said. For Birmingham native Calvin Macon, another Bards and Brews newcomer, it was a great experience doing poetry for the first time because he is a sculptor. Macon said he was also impressed by the diversity and the way events like these keep the arts community alive. Two other poets, Jamil Glenn and Jahman Hill, are Bards and Brews veterans. Glenn, a Birmingham native, has performed poetry since he was a teenager and has participated in the event about three or four times, starting when he was a ninth-grader at West End High School. Glenn said he learned about Bards and Brews through Brian “Voice” Porter Hawkins, a local artist who often hosts the event. For Glenn, each time he performs, it gets a little easier. The next Bards and Brews will be held May 3 at the BPL Central Branch, 2100 Park Place, Birmingham, Ala., 35203.